I like this as it’s applicable to the online virtual community of practice that physicians are using more and more. Educational needs are being met in different ways and with a flatter hierarchy between teacher and learner. Nice and thoughtful blog on how our worlds of engagement are changing. IMHO it most certainly does apply to Primary Care as we become more patient centred and collaborative with our patients. Everyone understands that things have changed, but not always how much and how far we still have to go. 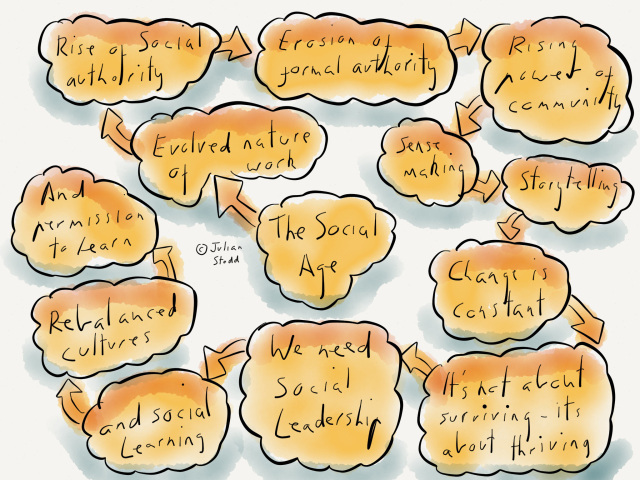 The Social Age is defined by change: changes in how we work, how we learn, how we lead, how we connect and communicate. Our entire ecosystem has evolved and yet many organisations are clinging to the remnants of eroded business models and HR practices. Those that are unable to adapt, unable to recognise and respond to the evolution will fail. This entry was posted in Uncategorized by DrKP. Bookmark the permalink.